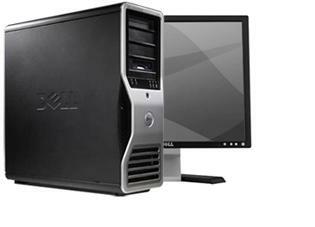 Why Rent a Desktop For your Event? Desktop rentals are great if you need temporary computers in a stationary context. For example, if you need to set up an information kiosk at your convention or trade show, for a temporary office setup, or if you need to demo software etc., a desktop rental would be ideal. Often times desktop computers rent for less than laptop computers. Since your Tech Travel Agent will handle installation, renting full sized units can be easy and impressive to your users. If you need one or one hundred desktop computers on a short term basis, contact a Tech Travel Agent for a no cost, no obligation price quotation. Rental periods can be as short as 1 day and as long as you need. Remember, the earlier you book your rental, the better the chance of getting lower rates. If you need certain software, whether it be Microsoft Office programs or company specific software, our agents can have every desktop rental preloaded with that software, so that when it is delivered to you each desktop is ready to go. Our PCs run the latest operating systems. Windows 8 and Mac OS X Mountain Lion are the latest on the market, depending on which OS you prefer. If you prefer an older operating system, such as Windows 7, Vista or XP, we can make sure you get the OS that you need. Sometimes one monitor isnt enough to run all corporate applications and keep your event or temporary office running smoothly. In those cases extra monitors can help streamline and speed up production. We can even construct you a video wall for a more dynamic and impressive display. Or if you require special or extra peripherals such as speakers, mics, headsets, keyboards, mice, then a Tech Travel Agent can procure those as well!